NEW ORLEANS – Dustin Nading of Western Oregon, Nolan Ellis of Colorado Mesa, Gatien Airiau of the Academy of Art and Nils Fischer of Angelo State were named the Men’s Scholar Athletes of the Year in NCAA Division II Track & Field on Thursday by the U.S. Track & Field and Cross Country Coaches Association (USTFCCCA). Combining their accomplishments in the class and in competition during the recently completed academic year, these four men were the most exceptional among a group of 308 male athletes who earned USTFCCCA All-Academic honors. Scholar Athletes of the Year were selected as the highest finishing performers at the NCAA Division II Indoor and Outdoor Track & Field Championships who achieved All-Academic status. Those athletes who won individual NCAA titles ranked higher in the tie-breaking process and cumulative GPA is weighed as the final advantage. Separate awards are given to track athletes and field athletes for the indoor and outdoor seasons, hence the four categories. Nading and Ellis collected the honors from the indoor season while Airiau and Fischer were awarded for their work during the outdoor season. Nading, a junior majoring in exercise science, recorded a cumulative GPA of 3.86 to collect the Men’s Indoor Track Scholar Athlete of the Year. The Longview, Washington native won the mile with a time of 4:13.30 and helped his DMR team to first place (9:41.40) at the NCAA Division II Indoor Track & Field Championships in March. He is the second athlete from Western Oregon to be named Scholar Athlete of the Year, joining middle distance runner David Ribich who took the honor for the 2017 Outdoor season. Ellis, a redshirt junior majoring in business administration and marketing, posted a cumulative GPA of 3.64 to collect the Men’s Indoor Field Scholar Athlete of the Year. The Parker, Colorado native won the national championships in the pole vault with a mark of 5.25 meters (17-2.75) at the NCAA Division II Indoor Track & Field Championships. 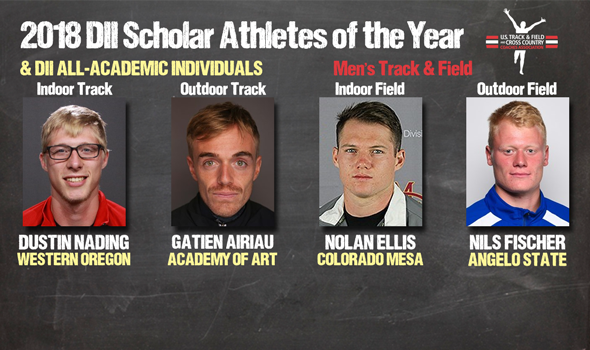 He is the first athlete from Colorado Mesa to be honored as a Scholar Athlete of the Year. Airiau, a graduate communications and media technologies student and native of Sassnage, France, finished with a cumulative GPA of 3.58 to get selected as the Men’s Outdoor Track Scholar Athlete of the Year. Airiau won the 3000-meter steeplechase title with an 8:46.99 performance at the NCAA Division II Outdoor Track & Field Championships in late May. He also finished 16th overall in the 5000-meter race (14:51.74). He is the first athlete from the Academy of Art to win the Scholar Athlete of the Year. Fischer, an international business major, recorded a 3.86 cumulative GPA to take home the Men’s Outdoor Field Scholar Athlete of the Year. The sophomore from Germany won the national championships in the javelin with a best toss of 75.19 meters (246-8) at the NCAA Division II Outdoor Track & Field Championships. He is the first athlete rom Angelo State to win the Scholar Athlete of the Year. To qualify for USTFCCCA All-Academic honors, student-athletes must have compiled a cumulative GPA of 3.25 and have reached a provisional or automatic qualifying standard for the NCAA Championships in either the indoor or outdoor seasons. Grand Valley State led all schools with 28 honorees.